Hello dosto aaj ham is post me batane ja rahe hai ki kis prakar ham apne youtube channel Subscriber ko hide kare. Dosto aisa karna bahut hi aasan hai aur is tricks ki mdd se aap kuch hi minutes me aap apne youtube chanel ke subscriber count ko hide kar sakte hai. 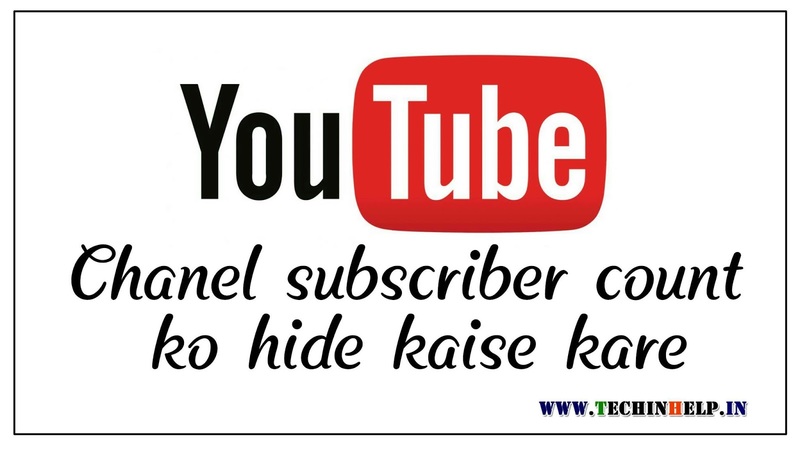 aisa kar dene ke aapke chanel ka subscriber count secret ho jaayega jisse aap khud hi apne chanel subscriber count ko dekh sakte hai dusra koie nahi. To chaliye dekhte hai ki kis prakar hum apne chanel subscriber count ko hide kar sakte hai. How to hide youtube chanel subscriber count ? Dosto agar aap chahte hai ki hamara apna youtube chanel subscriber count ke bare me koie aur na jane to niche diye gaye tricks ko apnaye.
) Ab aap Creator Studio par click kare.
) Uske baad Chanel par click kare uske baad Advanced par click karna hai.
) Ab aapko sabse niche Subscriber count Do not display the number of people subscribed to my chanel par check ka tick laga dena hai uske baad niche save par click kar dena hai. Ye sab karne ke baad aap apne youtube chanel ka subscriber count ko sirf aap khud yani user hi dekh sakta hai dusra koie nahi. Note : agar aap us subscriber count ko dikhana chahte hai to fir aap Subscriber count me Display the number of people subscribed to my chanel par check kar dena hai. Dosto aap is tricks ki mdd se aap apne youtube chanel subscriber count ko hide kar chuke honge. Agar aapko ye tricks helpful laga ho to aap apne dosto ke sath bhi is tricks ko share kare.